Discover the new modern base navigation, no change to course view or data, and all the benefits of cloud-hosting! As of January 1st, 2019, Blackboard migration to the cloud-based, Software-as-a-Service (SaaS) environment is complete. First, users should clear the cache of their browser(s) before logging on. Second, use the same Blackboard URL 'ole.sandiego.edu' to log on. Once you log in, you will see the modernized landing page with some new features such as a new Activity Stream feature, Profile, Calendar and Messages. Click on Courses to see all of your courses; current, past and upcoming. To learn more, attend workshops, quick start trainings, and orientation sessions, click on the links below. You can also make an appointment with the iTeam or visit us in the drop-in center in Maher Hall 194. Explore this web page for an overview of the new base navigation screen, description of features and benefits, and training links to learn more about the SaaS continuous delivery Product Releases in the new environment. Note: After the migration, ATS will commence with an early pilot of Learn Ultra, a next generation product. Refer to the Learn Ultra Pilot web page for details. Bb SaaS - What's New! After selecting a course from your Courses list, you will find the original course view with the same instructor interface, navigation, features, and tools. The current ole.sandiego.edu dashboard landing page displays your Courses and Organizations list as Modules, with support information in the upper right. Scalability- The platform easily scales during high usage periods and utilizes 2 data centers for recovery and back-ups. Monitoring- Blackboard support of the system is 24x7x365 with hosting on Amazon Web Services (AWS). Integrations- Utilizing industry standards, SaaS hosting allows for tighter integrations between third-party technologies, tools and publishing content. Faster Roadmap Releases- SaaS allows USD to pilot Blackboard's next generation course experience, Ultra. With consolidated workflows and integration of data, faculty and students can experience the latest in this streamlined user experience. Jan. 1st, 2019: Blackboard is Back Up! Thank you for your patience during the Blackboard migration. We apologize for any inconvenience the upgrade may have caused you. Before you log in to Blackboard you need to clear the cache on your browser(s). When you log in to Blackboard at ole.sandiego.edu you should see the upgraded landing page. Please see the before and after if you are uncertain of what you are seeing. Your courses should still function exactly as they did prior to the migration. If you notice anything odd, please contact the iTeam immediately at iteam@sandiego.edu or 619-260-7900. Also, if you use any Blackboard apps on any of your devices (phones, iPads, etc.) please uninstall them and reinstall them. As a reminder, FA18 final grades are due by noon on January 4, 2019. The Instructional Support and Training Team is available to support faculty in the GradeCenter export and answer questions regarding the migration. Please contact us at iteam@sandiego.edu or 619-260-7900. Email to faculty sent 9:00 AM on Thursday, December 20th, 2018. One week from today we will be taking Blackboard down and moving it to the cloud. This will be our final email reminder to you. Please reread the information once more to make sure you are aware of every detail and how you will be affected. To move our instance of Blackboard to the cloud, Blackboard will be inaccessible from December 26, 2018 - January 1, 2019. Please see our timeline and FAQ at sandiego.edu/ultra for more information about the migration. Extending the grading period. Thanks to the Office of the Registrar for extending the grading window from January 2, 2019, to January 4, 2019. FA18 Bb GradeCenter Export - Faculty teaching a Fall 2018 course utilizing the GradeCenter may want to export their GradeCenter so they may continue to work on their grades, offline of Blackboard, while the system is down. The following job-aid provides instructions on how to export your GradeCenter from Blackboard. Additional support hours have been added for Saturday, December 22, 2018, to assist faculty in downloading their Bb GradeCenter or completing any other essential tasks related to final grades. You can call x7900 between the hours of 10:00 AM to 2:00 PM for direct access to support on Bb grading. Please note: MySanDiego portal will be accessible during this downtime so you may still enter final grades. Faculty that do not use Blackboard or do not use the Bb GradeCenter to calculate their final grades, please enter your grades into the portal by January 2 in order for the Registrar to begin processing their reports. Blackboard’s URL will remain the same as before the migration: ole.sandiego.edu. All students, faculty and administrators will use the same URL and credentials to access the system. Course Requests - You will continue to request your upcoming courses by filling out the same forms and following the same processes. Prepping Intercession and Spring Courses - The system will be an exact duplicate of our current instance. All work done prior to December 26, 2018, in preparation for the Winter Intercession (19) and Spring 2019 terms, will be preserved when the system comes back up on January 1, 2019. After the migration, faculty and students will experience an enhanced and upgraded login page and landing page. See the before and after. This will not impact your course experience. Your courses will function exactly as they did prior to the migration. We will have several Look at What's New! classes for those of you who would like to become more familiar with the new landing page. Register to learn how to edit your profile, change your notifications, and use the Activity Stream to your advantage! We hope to make this migration as pain-free as possible for all. The Instructional Support and Training Team is available to assist faculty or answer questions regarding the migration. Please feel free to contact us at iteam@sandiego.edu or 619-260-7900. Email to all faculty on Dec. 10th at 9:00 AM from IT campus mail. Since we are getting closer to our migration timeline, we are sharing this information with the community again. From the plumbing to the paint, Blackboard is getting a major renovation. In late December 2018, USD’s instance of Bb will move to cloud hosting which will give all users increased performance, streamlined workflows and a modern look. Please note: MySanDiego portal will be accessible during this downtime so you can still enter final grades. Faculty that do not use Blackboard or do not use the Bb GradeCenter to calculate their final grades, please enter your grades into the portal by January 2 in order for the Registrar to begin processing their reports. A Blackboard Migration Learn@Lunch is scheduled for December 11th. Register now to reserve a seat and learn more about the migration. Lastly, after the migration, faculty and students will experience an enhanced and upgraded landing page. See the before and after. This will not impact your course experience. Your courses will function exactly as they did prior to the migration. Email to FA18 Blackboard faculty on Nov. 14th at 3:00 PM from IT campus mail. Academic Technology Services (ATS) is moving our instance of Blackboard to the cloud. Blackboard will be inaccessible from December 26, 2018 - January 1, 2019. Since this downtime will impact your grading and access to Blackboard GradeCenter, we wanted to share some specific information in this regard. Here are some specific considerations for faculty teaching a fall 2018 course and use the Bb GradeCenter to calculate their final grades. Please do not hesitate to contact us with any questions. 1. Export Your GradeCenter. We highly recommend faculty export their GradeCenter once finals are complete and before December 26, 2018, so they may finalize their grades, offline of Blackboard, while the system is down. Here is a job-aid on how to export your GradeCenter. By completing this process, it will ensure that faculty have access to all the students' grades before the system goes offline. 2. Extended Support Hours on Saturday, December 22, 2018! The Instructional Support and Training Team will available to provide support on this process on Saturday, December 22, 2018, from 10:00 AM -2:00 PM. They can be reached at iteam@sandiego.edu or ext. 7400. 3. Note: Final Grades Due Date has been extended. Due to the impact of this downtime on FA18 faculty, ATS has worked with the Registrar's Office to have the final grades due date extended from January 2, 2019, to January 4, 2019, at 12:00 PM (noon). Please note: If you can finalize grades sooner, please do. This will allow the Registrar's office to process their reports as soon as possible. 4. If you have not used the Blackboard GradeCenter in this capacity or have always used MySanDiego for grading your final grade, please continue to do the same. 5. After the migration is complete on January 1, 2019, faculty and students will experience an enhanced and upgraded landing page. See the before and after. This will NOT impact your course experience. Your courses will function exactly as they did prior to the migration. Additional support hours will be added for Saturday, December 22, 2018, to assist faculty in downloading their Bb GradeCenter or completing any other essential tasks related to final grades. Prepping Intercession and Spring Courses - The system will be an exact duplication of our current instance. All work done prior to December 26, 2018, in preparation for the Winter Intercession (19) and Spring 2019 terms, will be preserved when the system comes back up on January 1, 2019. Blackboard Migration Learn@Lunches are scheduled for November 30thand December 11th. Register now to reserve a seat and learn more about the migration. We hope to make this migration as pain free as possible for all. The Instructional Support and Training Team is available to assist faculty or answer questions regarding the migration. Please feel free to contact us at iteam@sandiego.edu or 619-260-7900. 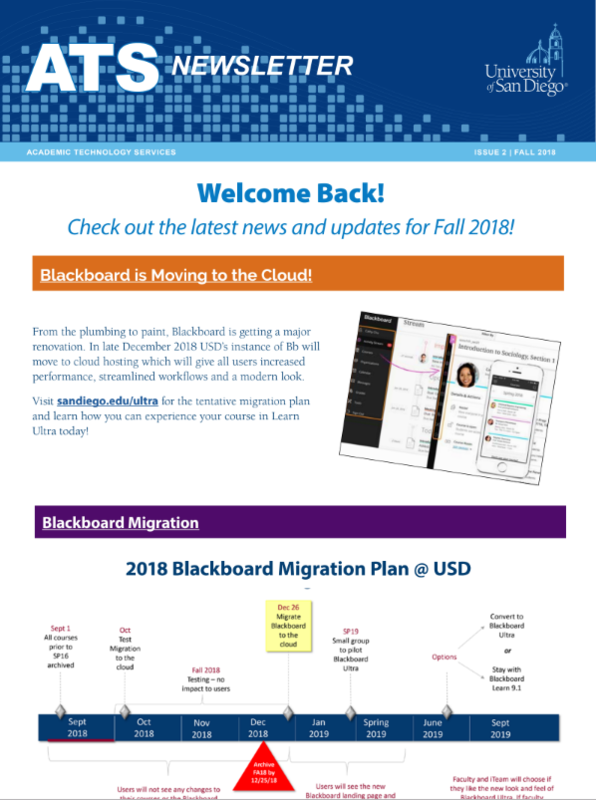 Sept. 19th, 2018: Blackboard Migration and Ultra - Get Started! Zero Impact- No downtime for students and faculty with the release of new updates to the system. Scalability- Platform automatically scales during peak usage. Monitoring- 24x7x365 system management on Amazon Web Services (AWS). Seamless Integrations- Utilizing industry standards between third-party technologies, tools and publishing content. Faster Roadmap Releases- SaaS (Software as a Service) allows USD to pilot Blackboard's next generation course experience, Ultra. To see a comprehensive timeline of the migration, and learn more about the process, please visit sandiego.edu/ultra. Get Involved! Join us for a Learn @ Lunch where we will discuss the migration process, benefits, and changes and talk about opportunities to pilot the Ultra Course Experience. Blackboard Learn with the Ultra Experience’s sleek design and updated workflows will help us to meet the demands of our students—while making your job of creating powerful online learning experiences even easier. Moving to cloud hosting allows us to activate this new course experience. ATS will be running a small pilot of Ultra in Spring 2019, but that doesn't mean that everyone can't get involved. Faculty can test their current course in the Bb Ultra experience. View this short tutorial on how to convert your course to Ultra. If you have any questions please contact iteam@sandiego.edu. Sept. 1st, 2018 Grace Period Added! Blackboard archive extended to 9/7/18! Email communication sent Sept 1, 2018 from ATS to Blackboard faculty and department liaisons. We have added a grace period so you can take care of of your Blackboard Course/Org Archives! The absolute cut off date is Friday 9/7/18 at 5 PM. We know that many faculty are just returning back to USD and we're extending time to assist them with their archival process. Regardless of this migration, archiving your course and downloading your gradebook after the end of each semester is a recommended good practice. What we (ITS) will archive: we will be moving ALL courses and Orgs from Spring of 2016 to Summer 2018 to the cloud (and later on when you are done with yourFA2018 course)-- you do not need to archive course/orgs you ran after SP16-- (albeit its a good practice). What You Will Need to Archive: IF you would like to keep/preserve and later on to restore an old course/org that you created PRIOR to Sp16, then you will need to archive them. While technically, you have been copying these old courses/orgs semester after semester and have transferred them to 2016, but then again, you know best what you would like to keep and archive and haven't brought over to 2016. So it is a good idea to archive them if you need them. It is really a very easy process. Need help doing this? This is why we added the grace period to Friday 9/7/18. Please come by to our drop in/ Faculty Support Center in Maher 194 this week and we are happy to assist. Each course archive does not takes about 3-5 minutes. Bring a flash disk so we can copy it for you. Archived FILES-- These are tiny/small files saved in a propriety format. 1) They do not take any space if you save them to your computer or on a flash disk. 3) When you need to RESTORE that particular archived course/org, you will send the archived file to the blackboard team (iteam@sandiego.edu) and we will do it for you. We have been running Blackboard since 1998! Some faculty have courses from a decade ago! Moving our Blackboard instance to the cloud requires that we clean up and only send those active courses/orgs in use. This process helps us to clean up, update and prepare for the migration. Our team will work on the TEST Migration process during Fall 2018 preparing for the actual migration on 12/26/18 after you are done with FA2018 courses. See us in M194 (Starting 9/4- 9/7) - we are ready to help! Again, if you or your colleagues need any help, just come by to Maher 194 or send us an email to iteam@sandiego.edu -- we can walk you through the process on the phone too. We simply need to clean up the server & only send refreshed and active courses/org to the cloud. All campus email sent Monday, August 27th August 2018 - ATS Newsletter - Technology Updates. Will we be moving to 'Ultra' after migration? Learn ULTRA is our Pilot Program. Try it. Test it. Join us! Still in early release, Learn Ultra is Blackboard's streamlined, next generation mobility solution. Ultra is a new paradigm in learning design and delivery, a dramatic change in UX interface and navigation. Learn Ultra will not be enabled after the migration at USD. The migration to SaaS will create a sufficient condition to pilot Ultra and its next generation mobility. ATS is conducting a pilot of Learn Ultra after the migration and is soliciting faculty input and feedback on the experience. The pilot program and advisory team will explore if, when, and how Learn Ultra could be enabled on an institutional scale. Future options and opportunities will be shared with the community. All information and updates about the Blackboard Learn Ultra experience, the course preview, and the pilot program is found on the Blackboard Learn ULTRA web page. Will I be able to grade during winter break? Can I use the Grade Center offline? How do I archive a Blackboard Course? Follow the instructions on this How to Archive a Blackboard Course job aid.